Welcome to my new website - it’s had a major makeover, thanks to Dave Meehan! After an amazing Christmas holiday in Kenya visiting family and canoodling with baby orphaned elephants, I feel refreshed. This January has, naturally, been a month of beginnings. Having pulled together my reserves I’ve begun to take on the wealth of opportunities that have come my way. I managed to sell a few pieces of work and almost finished a sculpture commission for Carymoor Environmental Trust. It represents a great crested newt using recycled components - deadline end of the month. In between, I’ve attended the first inspiring weekend session of an Outdoor Arts Development Course, delivered by Arts by the Sea, Activate Performing Arts, B-side and Outdoor Arts UK. It was great to meet other art practitioners working in different disciplines. Most exciting is the fact that I was selected for a Gilbert Bayes Award by the Royal Society of Sculptors, and have been to the first session in London to meet the other selected artists and learn about photographing sculpture from Anne Purkiss. I am so impressed by the strength of work in the group and look forward to exhibiting with them at the end of the year. 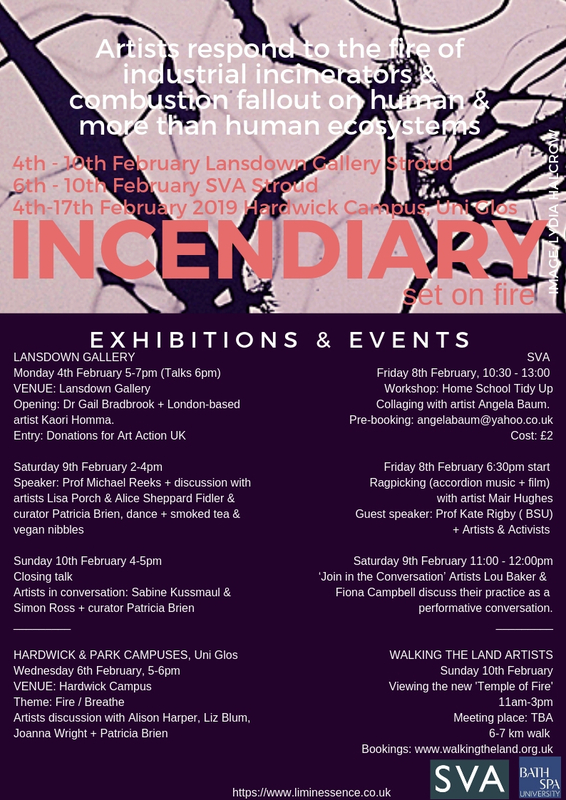 In February I am taking part in a multi-site, multi-disciplinary group exhibition ‘Incendiary’, curated by Patricia Brien. It spans one week, and is packed with all sorts of exciting happenings. My work ‘Glut’, concerning waste, will feature in the show at Stroud Valley Artspace (SVA), Stroud, 6th - 10th Feb. Lou Baker and I will be inviting the public to ‘Join in the Conversation’ at SVA - a performative discussion about our work on Saturday 9 February, 11-12. Come and join in! In my new role as part of the education team at the Holburne Museum, I ran a workshop with a mixed age group of schoolchildren. They created Double Portrait drawings linked to Hockney’s Mr & Mrs Clark and Percy, on show at the time. I’m scheduled to run some masterclasses at the Holburne later this year. Things come in waves and I think I’m on a big one… Ready Steady… Go! For me, this past year has been exceptional - hugely important to my creative development, and personally. High and low life-changing events have caused great shifts in my practice. Focusing on the highs, I was delighted to have gained a distinction in my Masters in Fine Art, and thrilled to have recently been selected for a Royal Society of Sculptors Gilbert Bayes Award. I am greatly looking forward to the mentoring sessions and other development opportunities, and very happy to be a part of the RSS. In the last few weeks I have been re-calibrating. This has included sorting my studio space, planning new projects, running workshops, invigilating at Hauser & Wirth, starting a commission, visiting exhibitions in London, and making a giant octopus sculpture to lead the Shepton lantern parade (22 Dec) in collaboration with the Rubbish Art Project and local community, using colourful recycled plastic and wire. I’ll also be working towards creating a site-specific body of work for a Residency and Solo Exhibition in the Cells, Town Hall Arts, Trowbridge, April – May 2019. The cells will provide an interesting test space in which to explore new ideas and processes. Alongside this, I’ll be running workshops. 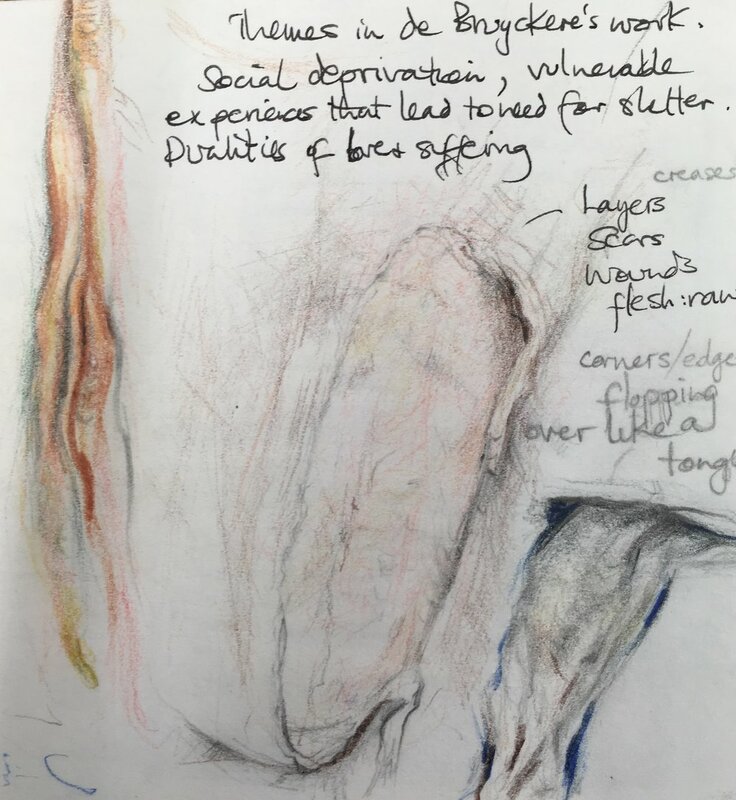 The work will potentially lead to another project later in the year in Shepton Mallet prison – more info on this and other exhibitions later. All the best for a happy, peaceful, fulfilling Christmas and New Year! The talks highlighted inspiring examples of socially engaged practice and collaboration. 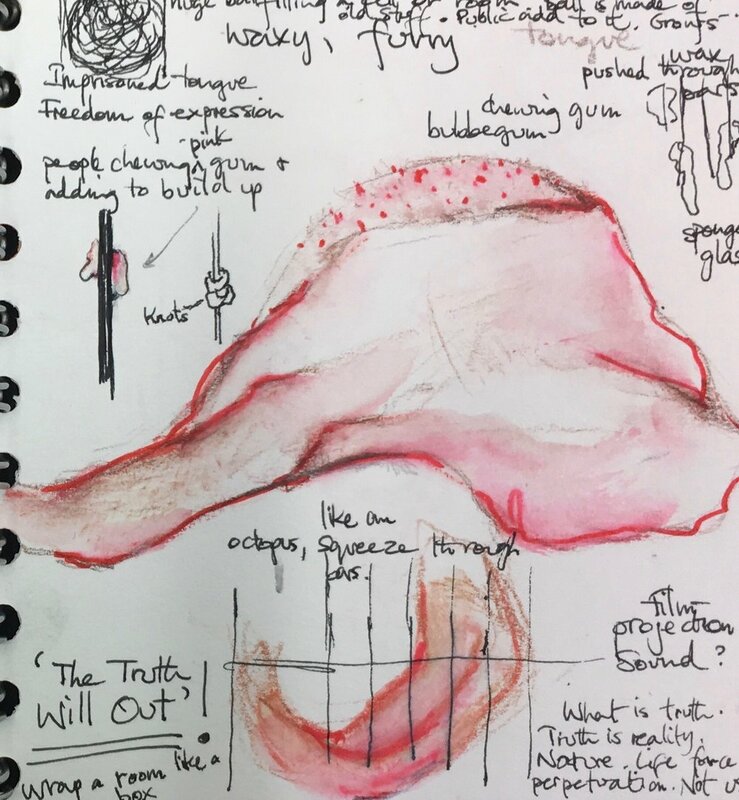 In workshops with Kerry Harker and Lydia Catterall we discussed the imperative for resilience, forging artist-led initiatives, and finding interesting spaces to show our work. With this in mind, I’ve been planning a few interesting ventures for next year. Two happen to involve prison cells. I’m excited to be mulling over ideas for a residency culminating in a solo exhibition in the basement cells at Town Hall Arts, Trowbridge, in the Spring. Alongside the show, I'll be delivering some related workshops with the young and elderly. I am also in early stages of organising a joint art project and exhibition with Luminara Star and the Rubbish Art Project in Shepton Prison (the oldest UK working prison - now vacant until it gets developed into residential homes). The cells are still in tact. 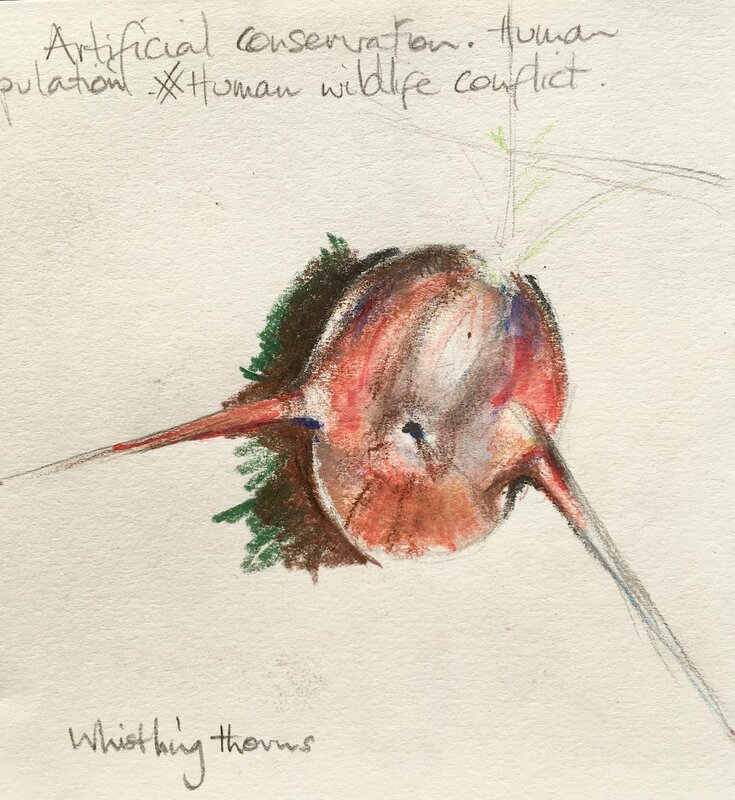 Both sites are unique, intriguing spaces for site-specific work, full of dark, sad histories, appropriate for creative responses to current society and environmental issues. On a sunny day, light through the windows, steel bars and grids casts dramatic linear shadows. The prison, now silent, has great acoustics - one can only imagine the sounds of its past. We hope to include other artists, possibly sound, film, performance and installation and will engage the community in the making process. A recent tweet about a bull elephant being shot because it broke out of its fenced enclosure in South Africa made me fume. Almost as bad as poaching and trophy hunting. It turns out they did not maintain the fences adequately, and all he was doing was naturally pushing boundaries, exploring, roaming beyond barriers – human imposed after all. Why shoot him? Because he wasn’t towing the line we impose for our own humancentric logic. So, this creature – a symbol of our great and mysterious oceans- inspired my design for a giant octopus lantern to lead 2018 Shepton Lantern Parade (see top). I am making the chicken-wire structure, then working on it with the community and the Rubbish art project in workshops at the Art Bank,Shepton Mallet, using recycled materials, especially plastic. Workshop dates: Sat 24 Nov 11am-1pm, Mon 26 11-1, Mon 3 Dec 7-9pm, Thur 6 Dec 4-6pm + more... To take part in a workshop email lucy@therubbishartproject.co.uk The Octopus will be lit by led lights and paraded on 22 December with the Shepton Lantern Parade. Please come along! Creature and environmental concerns continue to engage me, as does the blurring of boundaries. My thoughts are currently meandering around concepts of confinement, caged animals/humans, factory farming, obstruction, barriers, walls within walls.. and I'm sure there will be an element of the tentacular. I received the official results of my Masters in Fine Art this week and delighted to have passed with distinction! In between tidying up my studio so it's fit for purpose, I've started working on a 1 metre Great Crested Newt as a commission for Carymoor Environmental Centre in memory of Hamish Craig, whose amazing contribution to Carymoor was instigated by great crested newts found there. Last week I ran my first workshop as part of the Holburne Museum education team. It was an A'Level life-drawing session linked to 'Rodin: rethinking the fragment'. It encouraged me to do some of my own life-drawing beforehand and prep on Rodin's link with the Pantheon sculptures, which all helped. 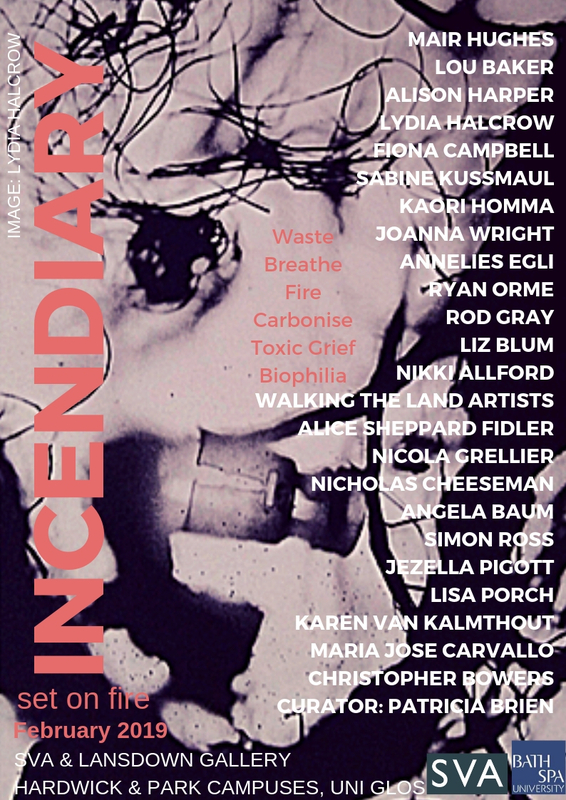 Forthcoming exhibitions include: Residency and Solo Exhibiiton (title TBC), The Cells, Town Hall Arts, Trowbridge, April - May; Incendiary, Landsdown Gallery and SVA, Stroud, 4-10 February 2019; Marks Hall Sculpture, Essex, 20 July - 1 September 2019; Reformation, Bishops Palace, Wells, July - October 2019. More info to follow. My website is undergoing a complete rehaul and a much needed paring down. Watch this space! My intense 2-year MFA course at Bath Spa Uni has now come to a successful end. I threw myself into it mind and body, so the past few weeks have been a strange time of re-adjustment and reorganising, sadness, but also hope for exciting work ahead. Time to move on. Below are some images of the 3 works I presented for the final module and MA Show - thanks to John Taylor for some of these photographs. Through the MA, my practice has undergone a series of shifts; it has developed more integrity, an expansiveness, but also a paring down in approach. I was happy with the results and delighted with my grade. Inspired by reading ‘Planet of Slums’ (Mike Davis) - rich/poor divide, precarious lives, cruelty to humans/animals; watching ‘Our Daily Bread’ (Nikolaus Geyrhalter) – factory farming; ‘A Plastic Ocean’, and grief over the death of my dog, my response is a form of suturing. Concerned with waste, ‘Glut’ is a set of wrapped, woven and stitched tentacular entrails, viscous hybrids transformed, suturing trash into treasure, both seductive and disgusting. The materials (especially personal items) speak of past lives, loss, textiles, craft. In contrast, the organic forms symbolise death, violence, but also vulnerability and renewal - the duality of horror and tenderness. ‘Accretion’ is an accumulation of many parts. Its evolution, the labour-intensive process of its making is an important element in the work. It is an abject object. It has connotations of the intestine, a metaphor for waste, excess and recycling, and other tentacular forms. Like pulling hair out of a plug, it is repulsive, ambiguous. We are all of the earth; the earth is flesh and bone. ‘Of Bones’ demonstrates a relational play of human-made and organic materials. The juxtaposition of fragile, translucent parched ‘bones’ against metal and wood sets up dynamic tensions. Cast branches as limb-like forms are playful abstractions. It references Picasso’s Crucifixion series inspired by Matthias Grunewald. Christ’s tortured hand is interpreted from the cast of a found piece of gnarled wood. The work also references Goya’s ‘Disasters of War’ series and Mark Dion’s trees. Regarding humanity, Christ’s words from the cross: ‘they know not what they do’ resonate. Since re-entering the outside world I have been catching up on loose ends, establishing new connections, working on a commission, running workshops and other bits and bobs. In a one-day workshop at Beckington First School (via SAW) working with tinies aged 4-9 years old, we made a whale, fish & other sea creatures. Every child in the school took part in making the sculptural artworks using recycled materials, especially plastic as an environmental project highlighting waste. It was linked to the story of Jonah and the Whale to tie in with the school’s current theme Retell, Reused, Recycled. After I fixed all the components together, the sculptures were installed in the school grounds for permanent display. One morning I taught acrylic painting to a group of 17 U3A adults. They all produced lovely still life paintings - a few illustrated below. I was commissioned to make a set of copper bird feeders for Horatio’s Garden, Stoke Mandeville. Some commissions are more interesting than others. This one has increased my understanding of copper and the process of annealing. I love watching the colours change through application of heat. Copper expands when hammered into a sunken mould. For moulds I used found steel objects and carved a couple in wood, thanks to Nick Weaver. Quite a long process but a fascinating transformation. I am using these copper processes for a range of shop Christmas decorations (Fosse Beads and Friends, Frome). Next commission is to make a 1 metre Great Crested Newt for Carymoor Environmental Centre using recycled materials. It has a lovely backstory, which I will relate in another blog soon. Yesterday I sold a large sculpture made a few years ago to a lovely couple, who I know will give him a great home. ‘Man Models Himself On Earth, Earth On Heaven’ (my longest title to date) will be added to as a site-specific residency, returning to my original plans for him to be more densely woven. I occasionally invigilate at Hauser & Wirth Somerset. I am elated that Berlinde de Bruyckere is now showing there with her Stages & Tales exhibition. During my MA I researched her work, which became a key influence to my practice. Her new body of work is more abstract: in her powerful series Courtyard Tales, she uses layers of decomposed, torn blankets as a metaphor for bodies, intimacy, decay, shelter, vulnerability, lust and war. There is a duality of love and suffering. I burnt my thumb badly with a glue gun the other day, and the scarred fleshy wound reminds me of details in her work. It was fantastic to have the opportunity to speak to Berlinde at the opening. There are crossovers between Berlinde de Bruyckere’s work and Takesada Matsutani’s adjoining exhibition ‘A Drop in Time’. It has been mesmerising to watch the stages of transformation since Matsutani performed the piercing of the bag of ink suspended over a wooden ball. Over time, single droplets fell repeatedly onto the ball causing remarkable splatters of ink, making an eclipse, flowing to the edges in its own way. The piece has developed over time. I find his work very beautiful. I love the simple gesture, the aspect of time and timelessness, the gestural hand-made labour-intensive process with graphite pencil marks on paper, canvas and wood. Like de Bruyckere, the work refers to the ‘endless cycle of life and death’. I am pleased to now be a small part of the education team at the Holburne Museum, Bath. 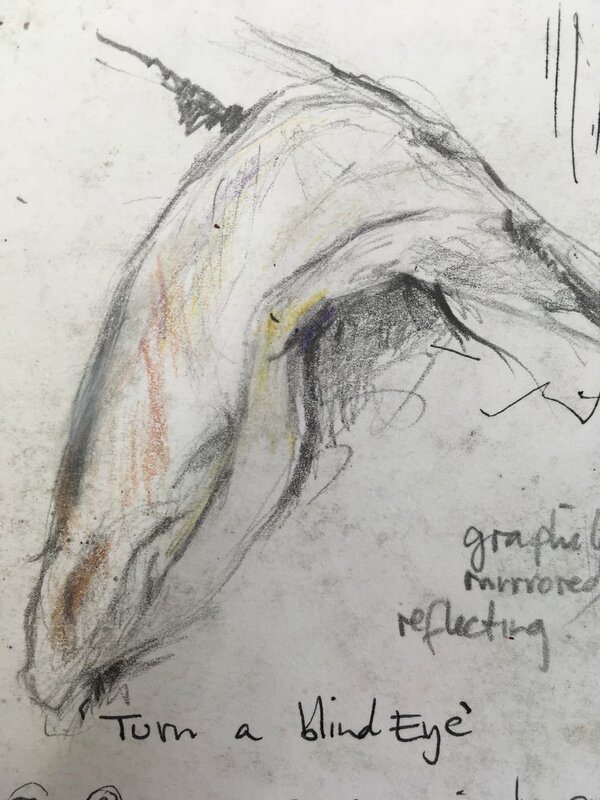 Next month I will be running a Life Drawing session for A’ Level students linked to the ‘Rodin: re-thinking the fragment’ exhibition. It may well re-ignite my own life drawing passion from years ago. I am allowing myself some head space before properly starting new artwork. Meanwhile this website is being changed (watch this space). Hope you can come along! The past few weeks have been devoted to completing work for my MA in Fine Art at Bath Spa Uni. All is now set up, research handed in, assessed and final preparations in progress for our Show, which opens with a Private View this Friday 21 September, 6-9pm. Please come along and celebrate with us! Below are a few sneak peeks of my work - though always better to see first-hand! I am delighted that my short microscopic film Spiderweb Safari has been selected for the Visions of Science exhibition at the Andrew Brownsword Gallery, The Edge, Univeristy of Bath. The exhibition runs 15 September - 13 October. This film still gives you some idea of the content. I am now catching up on other work, a couple of commissions and some workshops. Let me know if you are interested in any of the above.